I sold mark and Avon products for a brief period of time, and tried out many, many of their products. I really wanted to like their products, especially their foundations, because they were inexpensive to purchase as an “Avon lady”, but I can't say that they're better than drugstore foundations. First of all, there's the inconvenience of having to order them, and not being able to see the foun...read moredation in real life and swatch it, which I personally find to be a major draw back—you can't just run to the store or mall and pick some up! But even putting that concern aside, I still can't justify repurchasing this product. THE PACKAGING: It looks cool, and it's VERY sturdy on the outside. However, it's incredibly bulky. The cap takes up over half of the packaging, which is a huge waste. I don't like the applicator, because using it directly on your skin potentially contaminates the liquid foundation, and could make it go bad faster than a pump applicator would, or a squeeze tube. The sponge doesn't seem to be of very good quality, and not attached very well. 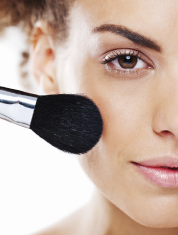 On top of that, the round spongey applicator doesn't do a very good job of actually applying product to your skin. After you dab some onto your face, I needed to use a foundation brush or a standard makeup sponge to actually spread the foundation evenly. THE COLORS: The colors all tend to run a bit orange. It was hard to match my skin color to the swatches in the catalogue—it seems like they ran a bit dark. THE WEAR: This foundation just has an average length of wear. I have very oily skin, and this foundation didn't do much to help control oil, so I ended up looking shiny after a few hours. THE COVERAGE: I would say this foundation has light-medium coverage. 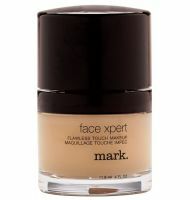 OVERALL: To be honest, I threw away this foundation before I'd even used a quarter of it. It just wasn't worth it. The applicator is horrible. It's definitely contaminating every time you apply it on your face and then put the applicator back in the jar. Yuk!